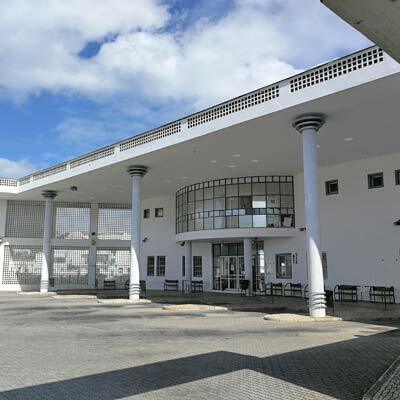 Tavira’s bus station is the main point of entry for visitors who are reliant on public transport to explore the region. From Tavira’s bus station there are local, regional and intercity buses, which serve the eastern side of Algarve or provide direct routes to Lisbon. This guide will provide an overview of the bus station and details about some of the most important bus services of Tavira. The following links are to timetables for useful bus services which depart from Tavira bus station, the links open new tabs. There are two local bus routes, which can be useful for visitors to Tavira. The first route heads west from Tavira and passes through the fishing village of Santa Luzia (10 minutes) and terminates at the small resort of Pedras D'el Rei (15 minutes). Pedras D'el Rei is the location to catch the mini train to Barril beach and the Cemetery of Anchors. A single ticket costs €2.20 and a return is €4.40. There are hourly departures during the week, but no services on Saturday afternoons or Sundays. The easterly bus route connects Tavira with the sleepy resort town of Cabanas. The service is hourly in both directions again, but there are no departures on Saturday afternoons or Sundays. The fare for a single ticket from Tavira to Cabanas costs €2.20, and a return is €4.40. Local bus tickets are purchased from the driver, who will refuse to take large bank notes. The important regional bus service is the route, which connects all of the towns along the eastern side of Algarve. The route departs from Faro and passes through Olhão, Tavira, Monte Gordo and terminates in Vila Real. The journey from Faro to Tavira takes 1 hour (€4.30), while from Tavira to Vila Real is 40 minutes. There are 10 daily departures in both directions during the week and 6 at the weekends. The bus service heading east from Tavira has many more departures than the limited train service, so it’s the recommended means of travel. There is not much difference between the train or bus services between Faro and Tavira. Train travel is slightly quicker and it’s more relaxed, but Tavira’s train station is further out of town and involves a 1.5km walk. There are direct bus services between Lisbon and Tavira, which are operated by Eva and Rede Expressos. The journey takes around 4 hours, as there are multiple stops along the route and a single ticket costs €20. During the summer months there are nine daily services and one-night bus in each direction, while in the winter this reduces by 1. Bus travel between Lisbon and Tavira does not require a connection as with the corresponding train route. Please note that trains from Faro to Lisbon must be booked in advance, while the regional train along Algarve does not. The bus terminus in Lisbon is the “Sete Rios’” bus station close to the “Jardim Zoológico’s” metro station on the blue line. Bus tickets should be purchased as far in advance as possible during the summer and tickets can be bought from the ticket office at both bus stations. Eva and Rede Expressos are part of the same organisation and buses are sometimes interchanged, but both companies provide safe, clean and punctual services. Tavira’s bus station is located on the “Rua dos Pelames” on the south banks of the Séqua/Gilão River. It is approximately 200m from the southern side of the Roman Bridge - turn right at the Republic Square and follow the road and river past the Old Pump House. Tavira’s bus station reflects the size of the city and is relatively small with only basic services. The ticket office is open from 7:20 am to 7:00 pm every day, but is closed for a 3-hour lunch at the weekend. In the bus station there is a small waiting area and cafe. Tavira’s bus station is always very quiet, and it’s perfectly safe even for late night departures.